Dogs are pack animals and they need a leader of the pack. In your dog's eyes, you, your family members and other pets living in the home compose your dog's pack. Dogs require strong, confident leadership. Many of the behavior problems dogs demonstrate stem from insecurity and confusion about who is in charge (i.e. submissive behavior, dominant aggressive behavior, etc. ).Dominant Aggression is the most common form of aggression in dogs and occurs when a dog attempts to take over the role of pack leader. Encourage your dog to earn the pleasurable and desirable things in life by obeying commands. Prior to greeting, petting, getting a treat, feeding, letting the dog outside, or walking, give your dog a command that your dog knows (i.e. 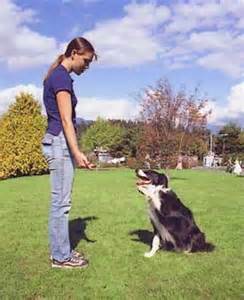 "sit"), and insist on compliance before the dog is allowed to have or do the desirable thing. Establish the pattern of having your dog sit before the dog greets anyone. Do not allow your dog on the bed or furniture. If you prefer your dog sleep on the bed, insist they lay at the foot of the bed. Dogs' preferred sleeping spots are on the right of the pack leader; therefore, if you allow your dog to rest in these areas he or she will think that it means she or he is the boss or leader. If your dog stands or lays in your path, insist that he or she move out of your way. If you step over or walk around the dog, you are showing a sign of deference. This sends your dog the message that he or she has the right to be wherever he or she desires and that you are not the boss. Do not allow your dog to go through doorways or narrow openings before you. Leading the way through narrow openings is the role of the pack leader. 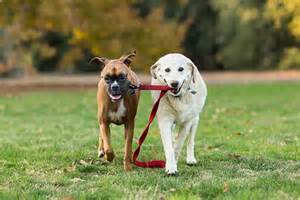 If you put your dog's leash on and then allow him or her to bolt out the door ahead of you to take a walk, the dog will think he or she is in charge and may be difficult to control during the walk. Do not allow your dog to go up the stairs ahead of you. Not only does this give him or her the feeling of leading the way up a narrow passageway, but when he or she reaches the top of the stairs and turns around to see you, it also gives your dog a sense of being higher and more powerful than you. than you. Give a sit command before the dog jumps to prevent the behavior. Do not allow the dog to demand attention or affection from you. You must provide petting, attention, and affection on your own schedule and according to your own terms. If your dog barks at you or pushes his or her muzzle under you hand or arm to get attention or force petting, ignore the dog and/or move away and then give attention or affection later. Be a confident leader for your dog. You should display a confident attitude, tone of voice and body language. Use good posture and look directly at your dog with a downward stare. Your dog will understand these behaviors. These body and language signals communicate to your dog and reassure him or her that you are in command. Hopefully, you will find these suggestions helpful. However, they are not a replacement for a veterinary consultation. If you would like to schedule an appointment for your pet or you have questions regarding behavioral or health issues, please contact us.